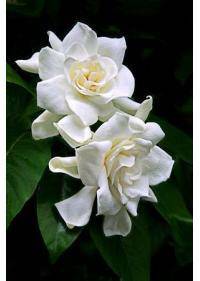 Gardenia is flowering plant that belongs to the coffee plant family. It is native to tropical areas, though it can be grown worldwide. These are most often found as evergreen shrubs or as a small tree. Blooms occur during mid spring or mid summer depending on species. Flowers may occur in clusters or as single blooms that are spread out. Many species are strongly scented, making them popular in bouquets. G. grandiflora is often grown as a houseplant for its fragrant blooms. It can be hard to grow as it requires a humid and warm tropical area. Many attempt to grow it in bathrooms or create a humid warm area.In addition to needing high humidity, it also needs very bright light. The light must be indirect as direct light may harm the blooms. Warm day and night temperatures must also be provided with the light. The soil for houseplants must be slightly to moderately acidic. This can be controlled with additives to balance the pH for plants. Well drained soil is a must, as it prevents the roots from rotting. Grown indoors, the plant will seldom reach higher than 18 inches. If it can be grown outdoors it may reach six feet in some climates. If grown outdoors blooms must be protected from water to avoid wilt. This species is slightly more forgiving when it comes to growing. This type of gardenia is often grown outdoors in warm climates. The blooms often reach at least two to three inches in diameter. Most plants in this species bloom for up to three months at a time. This provides the garden with ample blossoms that scent the air. These are also more sturdy blooms which can often resist wilting. These outdoor plants are able to withstand full direct sunlight. The more sun they are given, the more flowers will appear on shrubs. Shade can be used if necessary but the blooms will be less frequent. Fertilizer is often used to nourish the plant as it grows larger. An annual fertilizer will also keep the leaves a vibrant green color. It will also help with forming a stable root system for longevity. Some medicinal uses have been found for extracts from the plant. It has been found in folklore medicine and in Chinese medicine. These are not often used as they have not been thoroughly researched. The flowers are often used to create an essential oil or extract. This extract is frequently used to create perfumes or scented items. It is an especially popular fragrance for women's beauty products. Lotions, soaps and body care often feature this strong fragrance. It is often thought to be both energizing and relaxing when used. For this reason it may often be included in aromatherapy treatments. Gardenias are often seen in arrangements for weddings and funerals. These most often are used to express joy and happiness to others. They can often be purchased in areas such as El Cajon, CA, Plantation, FL, Miramar, FL, Augusta, GA, and Dallas, TX. In addition to wedding and funerals, these flowers can also be chosen for use in any arrangement in need of white coloration. The color may have impact for some but less importance to others. White gardenias are used to show purity and innocence of feelings. This is the most popular of the colors, and most commonly found. Gardenia bouquets may also be given as sympathy arrangements.